Here's a lineup of body care products for you to try to win. Open to US residents only, you have through 4/3 to enter. Good luck. New Zealand is one of the last bastions of purity as an environmentally protected and GMO Free region with the cleanest oceans on the globe. Case in point, Manuka is the gold standard for honey and is produced exclusively in New Zealand from bees and flowers that are environmentally protected. 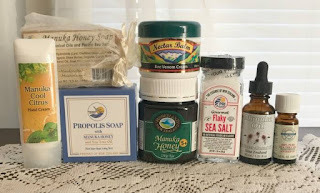 Enjoy these safe and soothing products every day and feel great using them! No artificial flavors, colors, no corn syrup or refined sugars and NO preservatives. Be sure and read Kristin's thoughts on the pampering Manuka Honey Body Beautiful products which includes a couple of beauty recipes you will want to try! Want to try a few of the Manuka Honey Body Beautiful products? Right now, you can get 15% off and FREE SHIPPING! To shop, go to shoppri.com and use discount code: Beauty15 at checkout. Now, we are excited to bring you an amazing giveaway! One lucky reader will have a chance to try all these fabulous products! 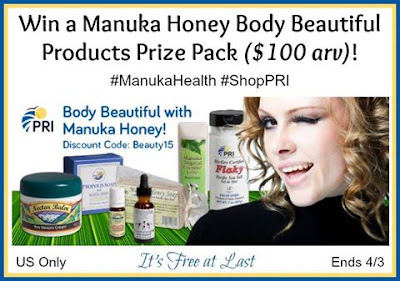 Manuka Honey Body Beautiful Products ($100 arv) Prize Pack! The 1/2 lb Manuka Honey. I so believe in the properties of Manuka honey. The Tea Tree Oil Conditioner sounds great! If love to try that one for sure! I am anxious to try these wonderful sounding products. I know honey is a powerful astringent and wound healer and Tree Tree oil does much of the same. I want to win!! I would love to try the Nectar Balm. I am anxious to try the Manuka Cool Citrus Hand Cream.